Clothing has changed over the years, but lets look in the past and see what it was like. 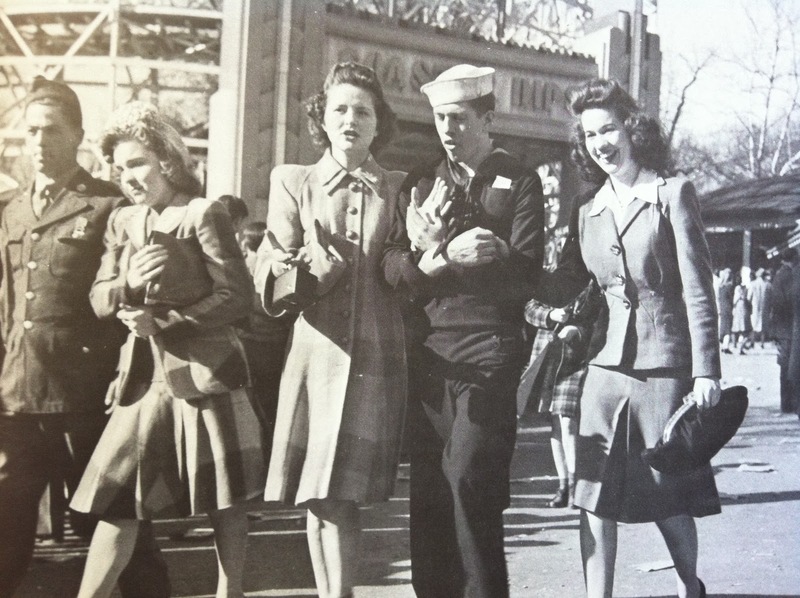 many decades have past since the world war 2 and how exactly have the clothes changed since then? After the war, there weren’t many drastic changes. Things did not instantly go back to normal once the war was finished. Debt and inflation were still big problems once the war had ended, and rationing was still in full swing. It took until 1947 for clothing restrictions to end and 1948 for materials and other rationed items to be free’d up, this is when the fashion revolution began. Mens fashion didn’t change drastically after the war, in America, men wore double-breasted suits that had broad shoulders , as rationing stepped down a bit, more material could be used and trousers eventually became styles with turn ups. The UK was a different story, rationing lasted a couple of years longer, and men had to make do with the suits provided by the government. Everyman was given a suit after the war, usually in grey chalkstripe or a blue. Taylors all around were taking the opportunity to change the style of suits, Savile Row began working on “The New Edwardian” look which featured a slightly flared jacket and a narrow cut. 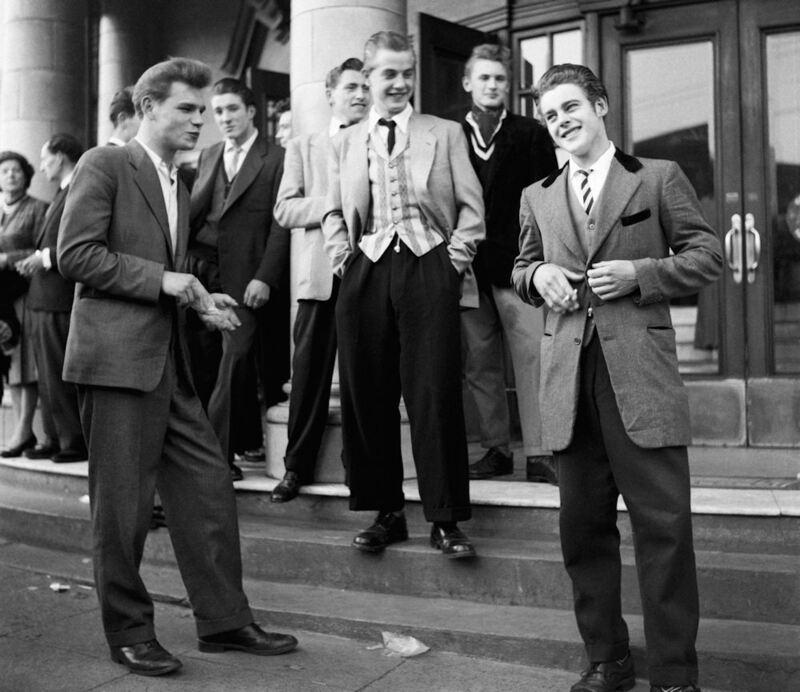 The Teddy Boys a British subculture began using this the new Edwardian look and added bright socks and a bootlace necktie which became popular across the whole of the UK. Already things within the clothing industry had begun to make a change, Dior had revolutionised the fashion industry and had been embraced by the public. The masciline time of the 40s had been transformed, hems fell and the hourglass silhouette had begun. It was at this time that the US War Production Board had sponsored a survey that helped create the standard sizing for the clothing industry. The Latter of the 1950s introduced a couple of new looks, Balenciaga had a big influence as well as Dior, He created standaway backs with fitted fronts, he introduced the sack dress and in 1958 Yves Saint Laurent successfully presented the Trapeze Dress for Dior. These items would all evolve into 1960s icons. 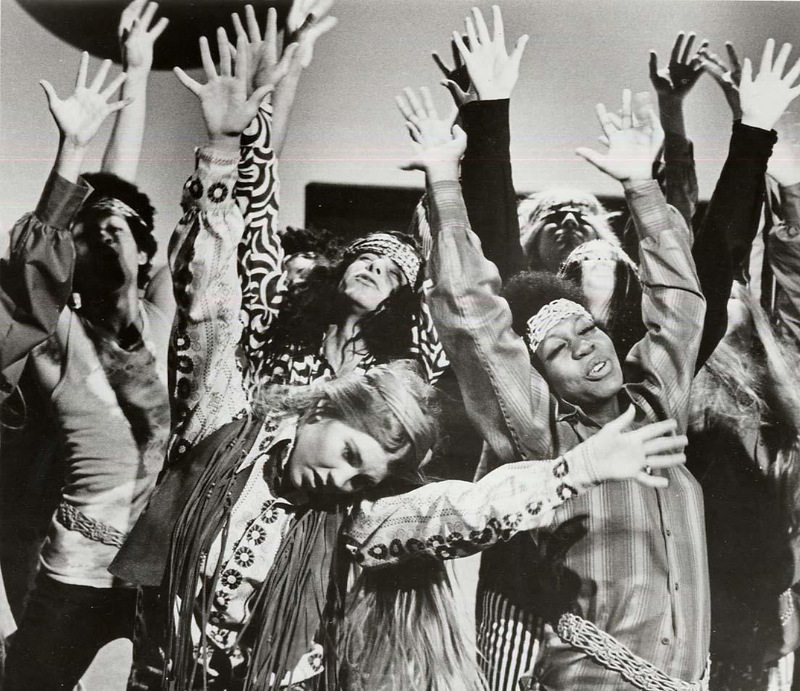 The 1970’s were probably the most interesting in terms of fashion, Bell-bottoms and the “hippie” look from the end of the 1960’s, some of the trends from the 1970’s still remain today. The 1970’s had many other extreme traits, including platform shoes with soles 2 to 4 inches thick! Flared trousers and jeans were also a mainstay for both men and women. 1970’s fashion was soon to be replaced by punk fashion, Straight cigarette-legged jeans, mules and ankle strapped shoes, which also featured back in the 1940s. Blue jeans and white sneakers made its way from the 80’s to the 90’s and colourful T-shirts and shorts tended to be the fashion. The 90’s saw some of the biggest brand names today rising to stardom, with Nike, addidas and various other sporting brands making their way into everyday fashion. 90’s fashion and now are not too dissimilar, infact, we’re even seeing a comeback recently with denim miniskirts and fuzzy cardigans. They say that fashion comes around, and history shows that this is very much true.